These Salty Oats - Portland Larder? When we lived in Brooklyn – which seems like at least a year ago, but in reality was a mere four months ago – I visited Brooklyn Larder three to four times a week. Conveniently located beside the Bergen St subway entrance and exit, I passed the store nearly every day. Brooklyn Larder isn’t just a cute name for a store – it’s intentionally curated to be a larder, a nearly-one stop shop for perishable and non-perishable foods, sourced from small-batch producers in Brooklyn, the United States, England, and Italy. When tomatoes were in season, I’ll admit that I averaged eating their perfect tomato, bacon, and egg sandwich on lightly toasted bread once a week. At its heart, Brooklyn Larder focuses on Italian preparations of mains, sides, condiments, and sweets. Their prepared food section displays an array of temptations: seasonal braised and roasted vegetables, giant heads of roasted garlic, polenta, and freekah and faro salads, among others. Their meat case is stocked with cured meats, lasagnas, and breaded chicken cutlets. And directly above their meat case sits their pastry offerings. The quality of Larder’s baked goods can’t be overstated. I frequently commented that Brooklyn Larder, part of a restaurant family that consists of Franny’s and the soon-to-be opened restaurant Marco’s, should also open up a stand alone bakery. They bake impeccable chocolate chip cookies, cupcakes, whoopie pies, and my all time favorite, a pistachio loaf cake. The cake manages that difficult task of containing a melt in your mouth interior with an exterior sturdy enough to not fall apart on your first bite. 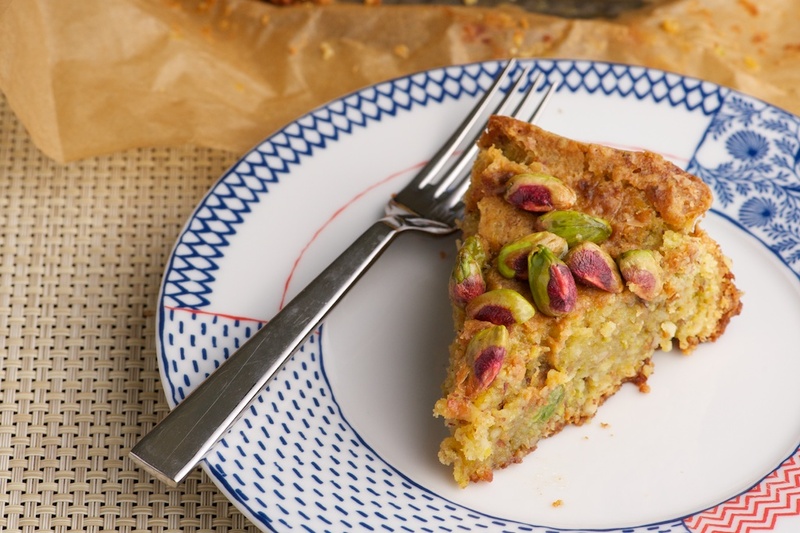 Each slice is topped with slightly candied, lemony pistachios. It is, in a word, addictive. And I haven’t found anything like it in the four months we’ve lived in Portland. Until last Thursday. Quite accidentally, I recreated Larder’s pistachio loaf, in cake form. 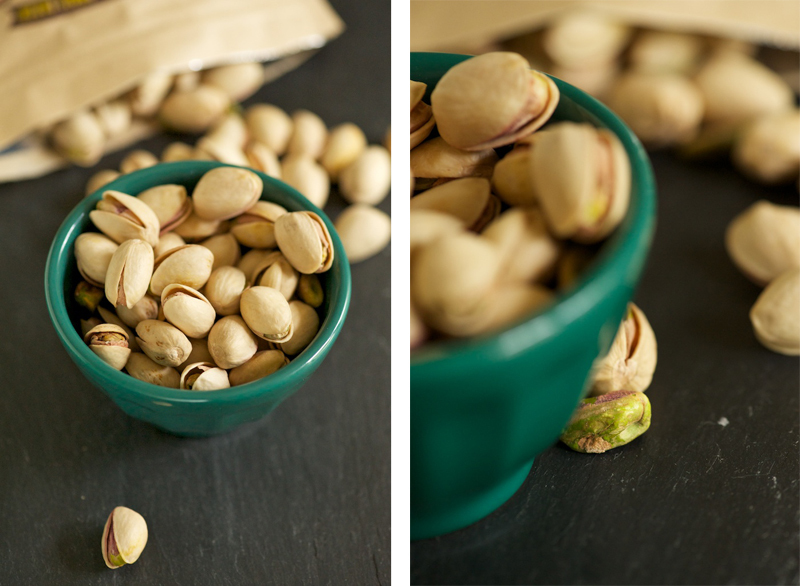 The taste is the same; the texture is the same; the candied pistachios are the same. This is dangerous territory! Instead of a slice of loaf to share, Justin and I have been working through an entire cake, and having zero qualms about it. 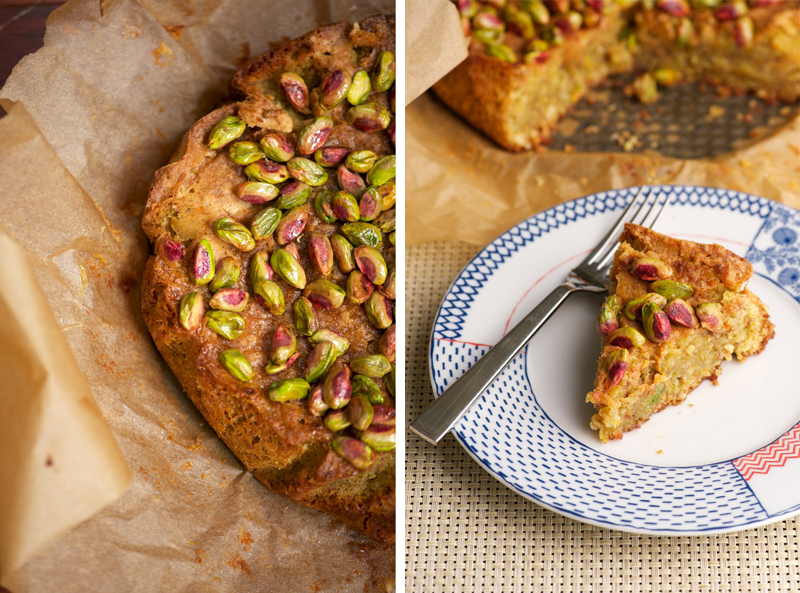 I initially picked this recipe because, as I’ve shared before, I gravitate towards anything with pistachios. I was flipping through the latest edition of Eat London, which is a veritable anthology of London’s best restaurants featuring select recipes from these restaurants and bakeries. 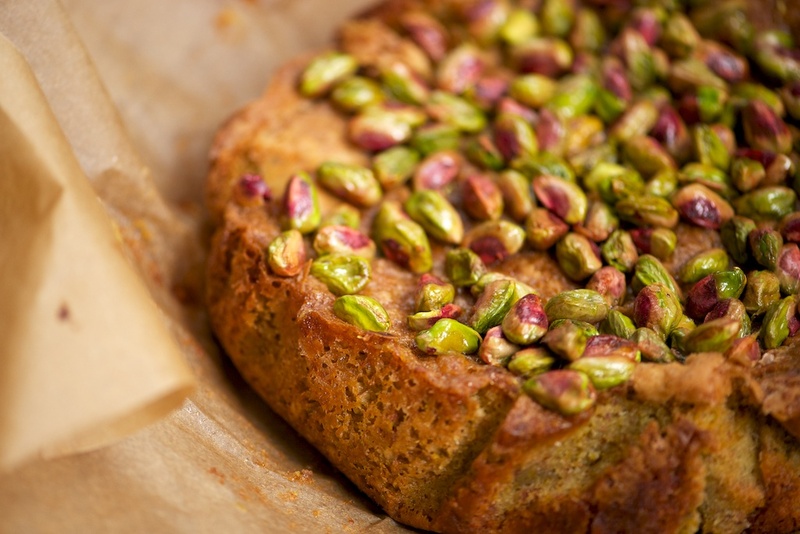 The final recipe in the book comes from Zucca: a pistachio, lemon, and almond cake. The photograph is appealing, but portrays the cake as dense and sturdy. As I started to gather the ingredients and taste the batter, I knew the end result was destined to be light and delicate; the airy batter merged together like a mixture of mousse and meringue. After I pulled the cake out from the oven, and allowed it to sit (a very important step in this recipe), I greedily took my first bite before turning to Justin and gleefully saying ‘it’s the Brooklyn Larder pistachio cake!'. I finally know how they create their loaf...and now I have the recipe to bake it as many times as I please (or is healthy). 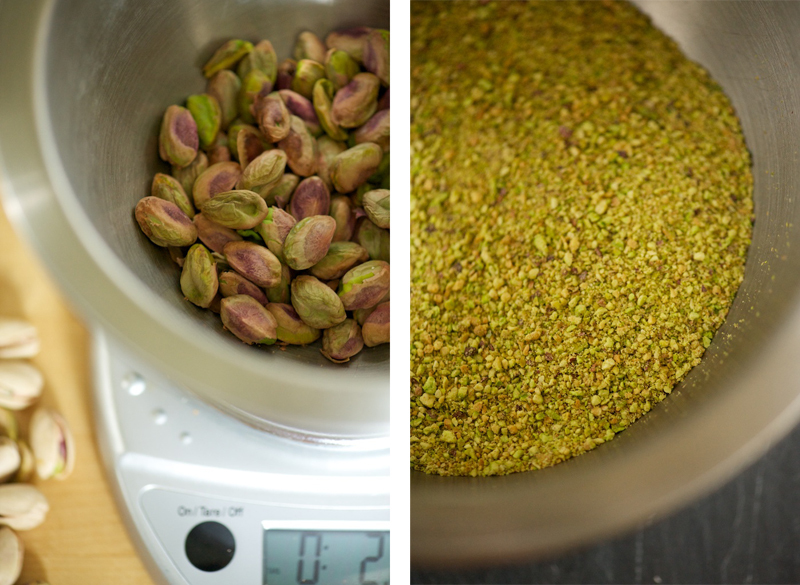 Process the pistachios in a food processor until they resemble a fine powder. Set aside. Process the almonds in a food processor in the same manner. Set aside. Preheat your oven to 325 degrees. Split the vanilla beans in half and scrape out their seeds. In a mixer, cream the butter and sugar together until very light and fluffy. *This will take close to 15 minutes! Once fluffy, reduce the speed to low and add the eggs one at a time, incorporating each egg fully before adding the next. Add the lemon zest and vanilla to the mix and then add the ground almonds and pistachios. Mix gently to combine. Finally, add the flour until just combined. Let the mixture rest in the bowl for 5 minutes. Butter an 11 inch cake tin with a removable base. Line the base with parchment paper. Spoon the batter into the tin and bake for 50-60 minutes (this will depend on your oven: bake until the center is set and a tester comes out clean). While the cake is baking, make the topping. Put the pistachios and lemon zest in a bowl. Put the sugar, lemon juice and orange juice in a small saucepan over high heat. When the sugar has dissolved and the liquid is boiling, pour over the pistachios, stirring to coat. 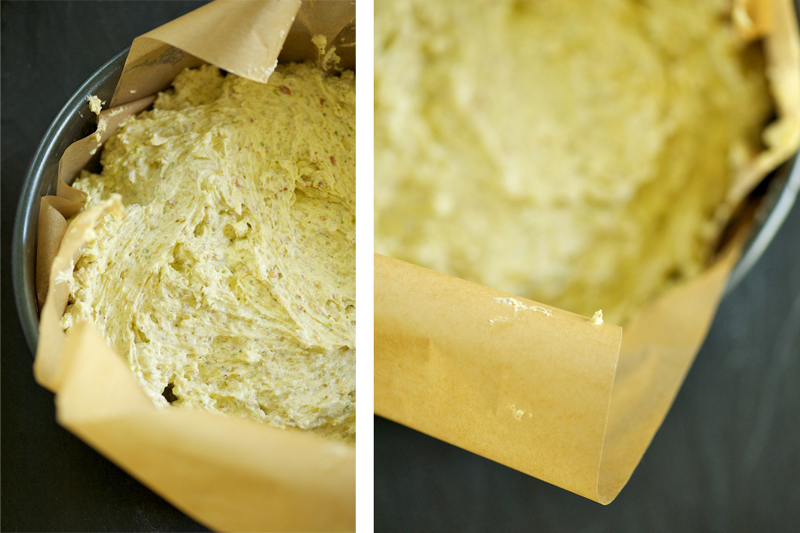 When the cake is done, remove it from the oven, and immediately pour the pistachio topping over the top of the cake. Let cool for for 20-30 minutes, until the topping hardens. Enjoy! Copious amounts of summer fruit have invaded my house.